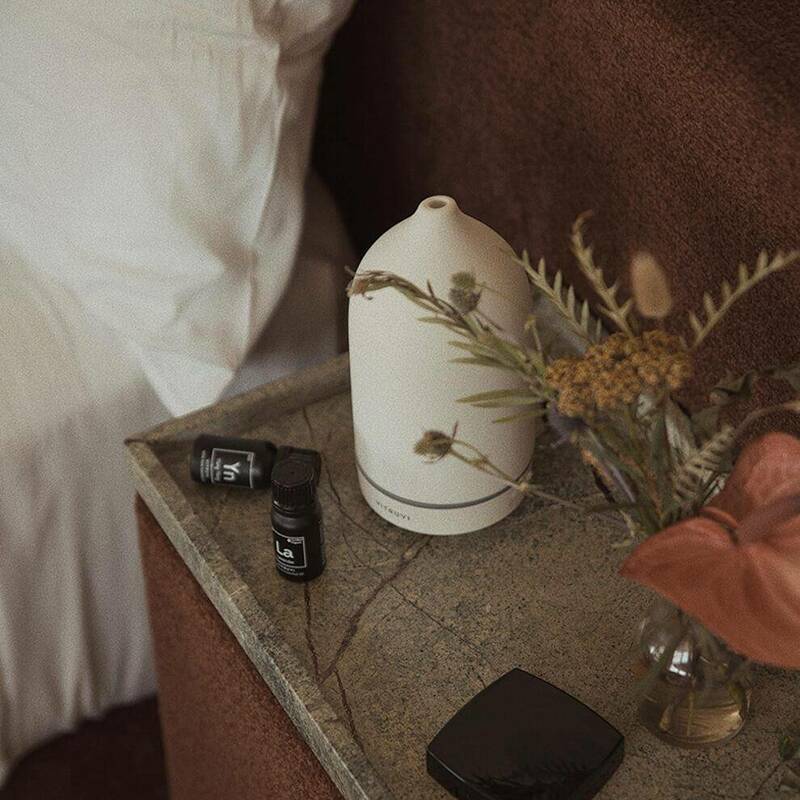 Whether you have seen them in a dreamy setting on Instagram or at our beautiful shop, Vitruvi products are without a doubt essentials to have in your home. So, we wanted to talk to you more about our favorite products. First of all, Vitruvi is a young company that was created by a woman, for women. With special attention and simplicity, the products are created to complement your beauty routine, your care routine and even your home. We love the essential oils offered which are 100% pure and some are even certified organic. So, zero worry to have by integrating these products in your house or in your beauty routine! Even moms will have some peace of mind;). We have a big crush on the pretty diffusers offered which are all in simplicity! They are easy to integrate into any decor, and discreet enough for a minimalist look. In our diffuser: We particularly like the smell of lavender and its relaxing effect, sweet orange for the holidays and peppermint for a touch of freshness. • Add 7 drops of Sweet Orange to pots and pans while washing them by hand to help cut grease. • Add 15 drops of peppermint to a spray bottle with water and witch hazel. Mist shower to keep it clean and smelling fresh. You may not know it, but essential oils can easily be incorporated into your beauty routine! You can add a few drops in your favorite products for different benefits! • Add 3 drops of lavender to your mascara tube to extend its life. • Mix 1 drop Tea Tree with a bit of coconut oil for a natural, astringent spot treatment. • Add 3 drops of sweet orange to your current moisturizer for a natural glow and vitamin C boost. The new products are just perfect for enhancing one's skincare routine; as much for the body as the soul! Mists are perfect to use on the body and face. We particularly like them in the morning to wake us up and get ready for the day, and at night to help us have a more relaxed attitude and get ready for a good night's sleep! Our favorite of the moment: The wake mist to help a little with the cold winter mornings and the Still mist to wind down after a long day at work. Roll-ons are super practical and can be slipped into your purse to be ready for any eventuality! Crushing hard on the Balance roll-on, which you can use to feel fresh on a plane or after subway ride and for the Focus roll-on that helps stay focused for the daily afternoon meeting at the office. So, how can you not fall in love with these products that meet all our needs so naturally and easily?